St Osyth is quite a large village with a contrast of housing provided as around the village centre there is a large number of 17th/18th century period properties ( Over 50 are Grade 11 listed ) and the Medieval St Osyth Priory which is a Grade 1 listed building. Away from the village centre there is also an extensive area of post war buildings. 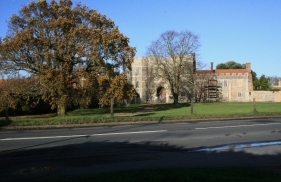 When entering the village via Colchester Road the deer park, within the Priory grounds, are located to the western side of the road and you will often see the deer grazing. As you head past the Priory into Mill Street towards Point Clear you will again encounter a variety of period and more modern properties and will then continue beyond The Creek towards Point Clear along Point Clear Road. There again is a lot of housing mainly post war in this area and many properties here enjoy large gardens. As you reach Point Clear Bay the area changes and whilst there is a number of residential properties along the sea wall the large majority of the bay is devoted to caravans and the holiday fraternity. At the western end of the bay and just across the water in Brightlingsea Creek is the town of Brightlingsea. The mud flats and saltings of Brightlingsea and St Osyth creeks to the north as well as Ray Creek to the south west are part of the Colne Estuary site of special scientific interest being of international importance for wildfowl and wading birds.